December « 2011 « What will I cook today? 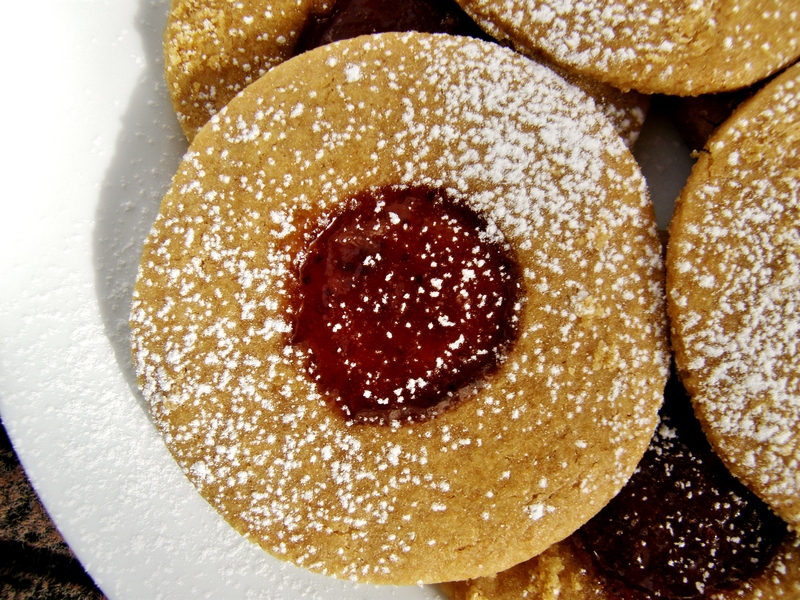 Linzer tortes. They’re fun to make. I’m a poet and didn’t even… yeah I’m going to stop now. 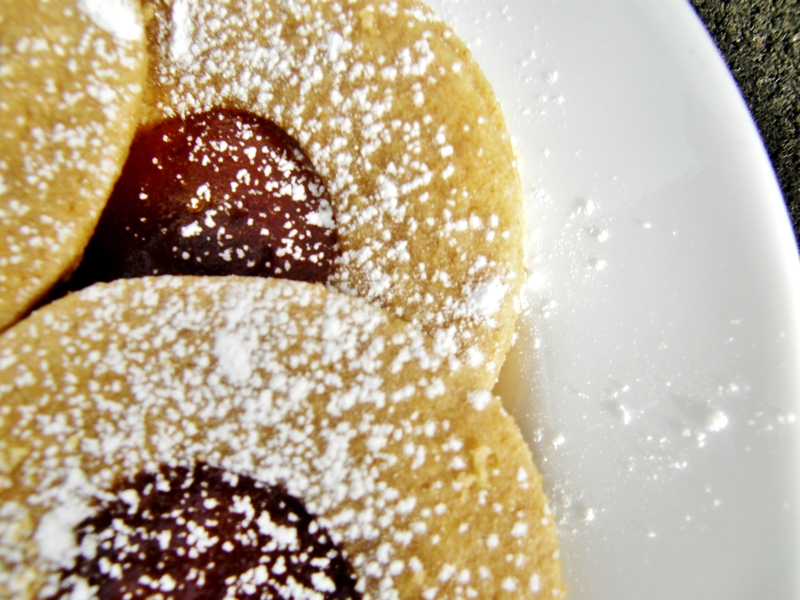 Linzer tortes. Still delicious even if slightly underbaked. My b. But you would have never known had I not said anything. Just err on the side of crispy, not tender. You’re browning butter again! In a tiny saucepan, brown the butter; over low heat, swirl the butter until the milk solids turn brown and the aroma changes from buttery to nutty. It’s easy to go too far so watch out! See the browned milk solids? That's what you are looking for. 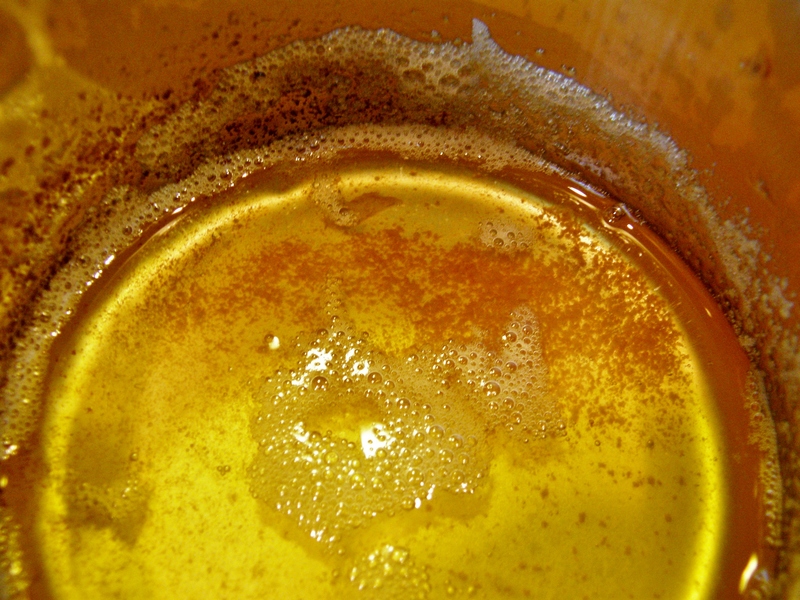 Combine sugar, oil, and browned butter in a mixing bowl; beat with an electric mixer until smooth (will take a while using raw sugar which has large granules). Add egg and vanilla and beat until smooth. Sift the flour, bakign soda and salt directly into the sugar mixture and mix on low speed until just combined. Divide the dough in half and roll out between sheets of parchment or wax paper to an even 1/16 inch thickness (as thin as you can without it being see-through, basically). Transfer the paper/dough/paper to a baking sheet and freeze 1 hr-3 days. Okay. You’re gonna need some time and quick fingers. Cut out round cookies with even numbers of simple round cookies and round cookies with round holes cut out (I used a water bottle cap to cut out the small holes). 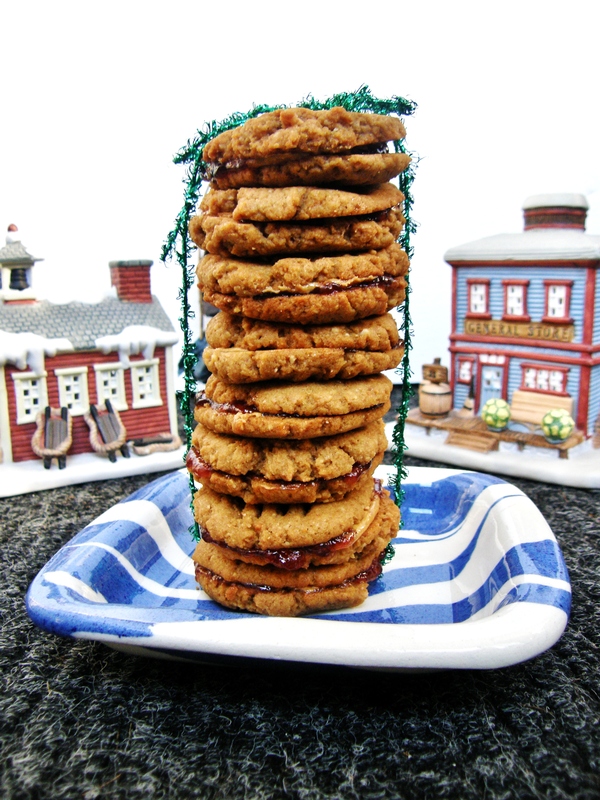 Place the holed cookies on top of the whole cookies (ha ha) and place on parchment-paper lined cookie sheet. You’ll need to reroll out the dough and re-freeze it to use it all up; also, the dough is pretty unworkable when it gets warm. Ready to bake? Preheat the oven to 350°F. Whisk the raspberry jelly (or whatever; I used blackberry, and strawberry) until smooth, and spoon a bit into each hole. Not too much, otherwise it will go all over the place (yes, experience). Bake 8-10 (I’d go with 10) minutes until firm to the touch and lightly browned on the bottom. Cool on wire racks and dust with powdered sugar. These were so yummy! I just love these cookies because they are so Christmas-y and interesting to eat. They are a bit time consuming to make but that only makes them that much more delicious when they are done. Look! So festive! Garland on our front stoop railing! Turkeys are Christmas-/New Year’s-friendly, right? I dunno. I just found this little loaf pan in the cabinet and figure hey why not? It was technically Fall when I made this… so there. Options: Grease either 1 regular sized loaf pan / 4 small (3.5 x 5.5″) loaf pans / 1 dozen muffin cups. Combine the wet ingredients and blend well. In a large bowl, combine the dry ingredients, including the nuts (coat with flour to decrease sinkage during baking). Add wet to try and stir well. 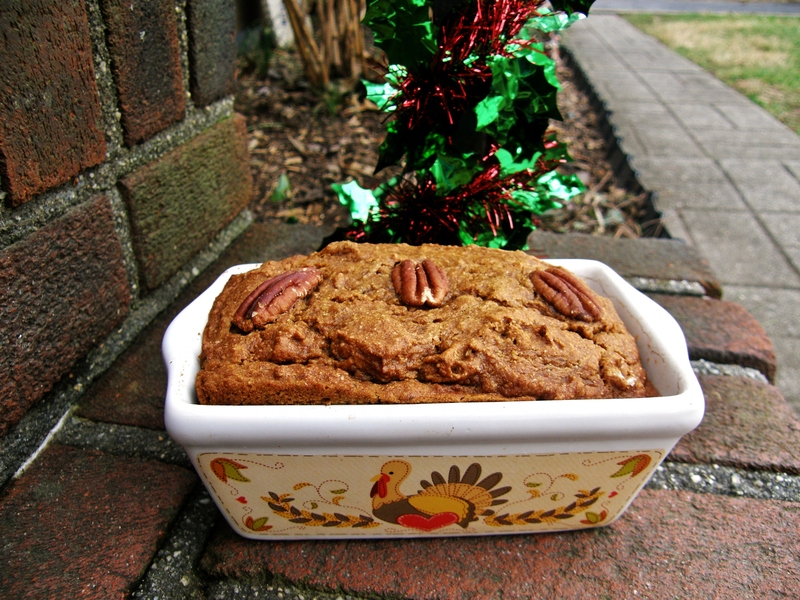 Pour into pans, decorate with whole pecans if using, and bake 60-70 min for one loaf / 35 min for mini loaves / 15 min for muffins. Let cool and remove from pan, or photograph while still in the pan if you’re a food blogging nutcase. 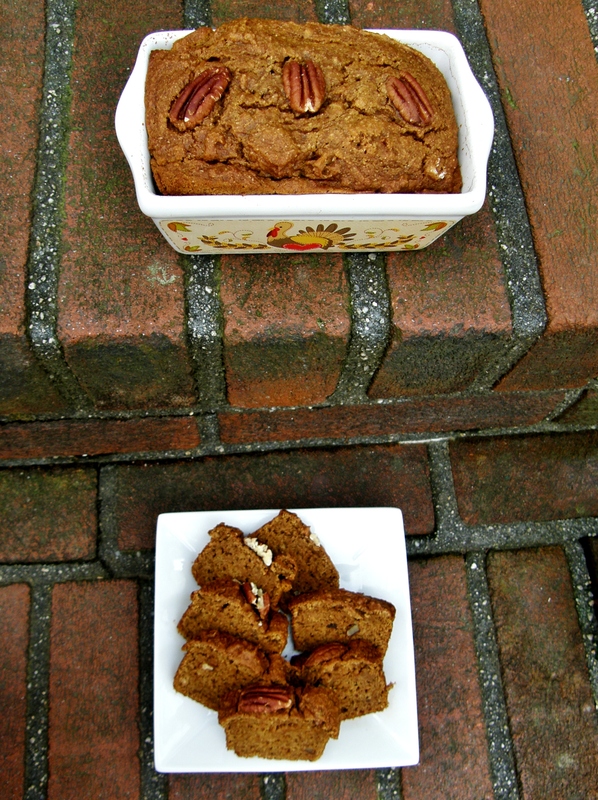 I made the mini loaves but the others are not pictured (you can imagine three other boring mini black loaf pans). This bread was so yummy! 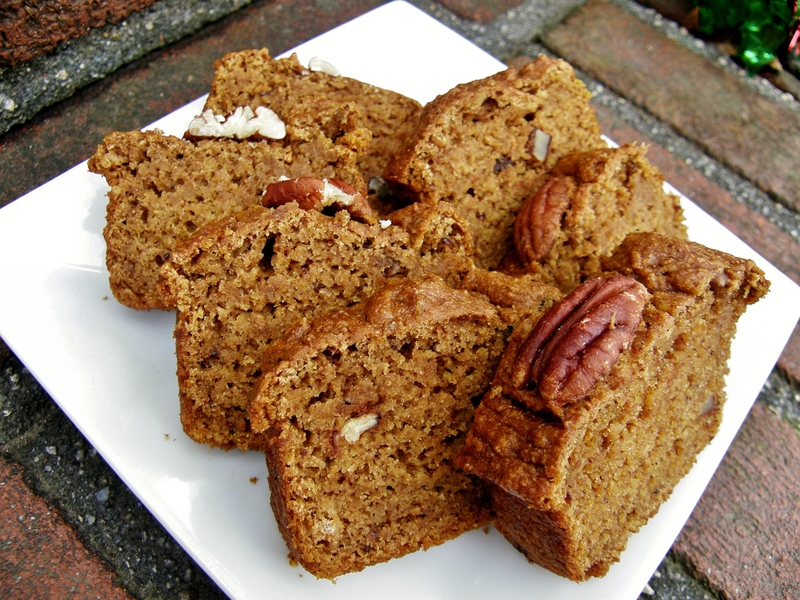 Super moist and dense, with a nice added crunch from the pecans. I decreased the sugar from 1 cup of granulated to 1/2 cup, and it made this bread seem less like a dessert and more like a good breakfast which was my intention. Using whole wheat flour–which is more absorbent than white–also helped with the texture change of using less dry sugar. Also, in case you didn’t notice, the bread is fat free, if that’s important to you… I quite enjoy my [healthy] fats in moderation however. As stated, the bread is rather dense (not in a bad way) but to have a lighter slice, sub 1/2 the applesauce for the same amount of canola oil. After learning how to brown butter in Principles of Cooking this past semester, I wanted to try it again! 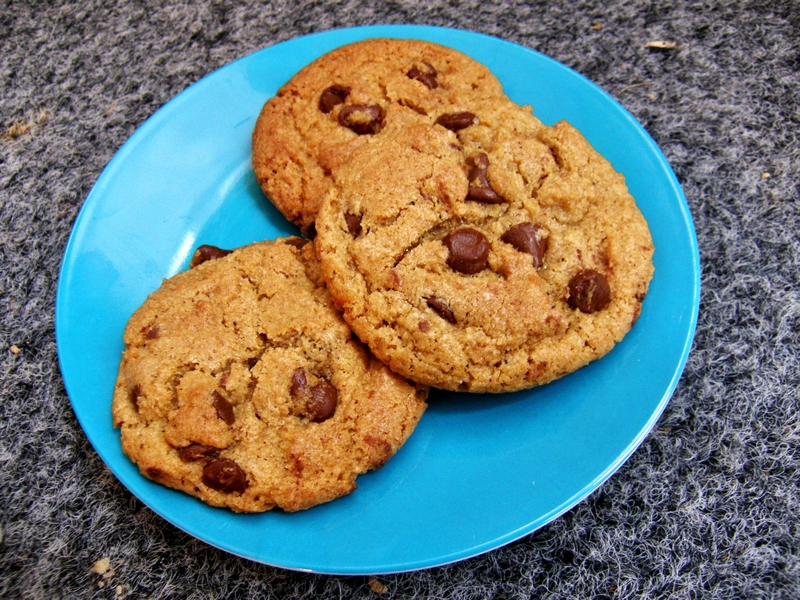 So I combined my yen to brown some butter with my mom’s penchant for chocolate chip cookies and found a recipe for browned butter chocolate chip cookies… highly delicious. Browned butter is butter that has been cooked until melty, then foamy, then browned — but no longer. The smell changes from the scent of melted butter to a nutty, earthy aroma that complements the molasses-sweet flavor of brown sugar and changes the flavor into something entirely new! 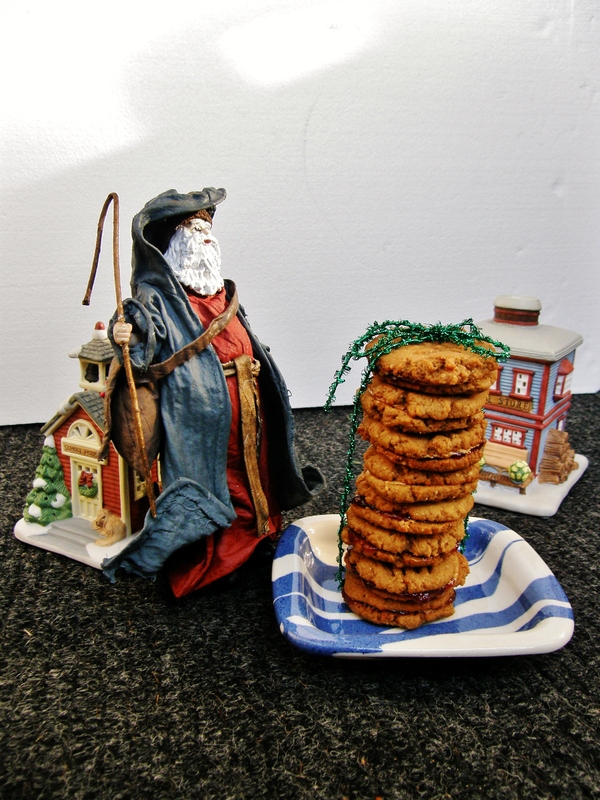 These cookies are sweet, most definitely, but not cloying. Okay, now go make them. Cut butter into 4 or 5 chunks and add to a warm, large skillet (NOT nonstick–so, just “stick”) (large enough to add sugar and other ingredients straight into) over medium heat. While swirling the pan or stirring frequently (but not constantly), cook the butter until the solid milk particles turn brown and gives off a nutty aroma (versus the smell of melted butter). It took about 10 minutes for me; it does take a while but take it off if you think it’s there; it will continue to brown even after you take it off the heat and it’s easy to go too far. Once browned to deliciousness, remove from heat and let cool while you do the next step. Combine flour, table salt, espresso powder if you have it, and baking soda and whisk lightly. Add both sugars directly into the skillet containing the browned butter, combine thoroughly. Add the egg and egg yolk, mix well, and stir in vanilla extract. Pour the skillet contents into the flour mixture and stir until combined; stir in the chocolate chips. Refrigerate the dough 24-36 hours. Don’t skip this step. It really makes a difference in the flavor and texture in the finished product. To bake, preheat the oven to 375°F and parchment-paperize a pan. Scoop out about two tablespoons worth of dough and place, leaving a good amount of space for expansion. Don’t forget: lightly sprinkle the tops of the cookies with a bit of sea salt. Bake for 12 minutes or until just cooked through; don’t overbake because even if they look underdone at 12 minutes, they will continue to bake on the pan and will actually achieve the perfect consistency. 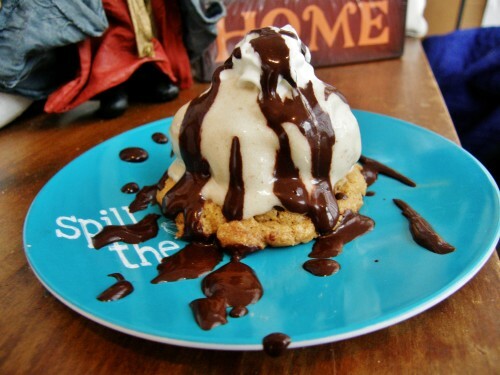 Maybe with some vanilla banana ice cream with whipped cream and agave chocolate syrup? I know, I’m nuts. Or maybe a genius. These cookies were soooo good. The browned butter taste really comes through and melds decadently with the brown sugar. The sea salt may be unorthodox but is so, so necessary… not because the cookie tastes horrible without it, but with the sea salt, you get the whole sweet/salty addictiveness aspect… plus a little crunch. These cookies come out crispy on the outside with a tender inside. As for espresso powder, I didn’t miss it, but I’m sure it would have taken these cookies to another level of amazingness. Preheat oven to 350°F. Line two large cookie sheets with parchment paper and set aside. *Pour chickpeas into a 1-cup measuring cup and pour in enough chickpea liquid just to cover the beans; puree chickpeas and their liquid in a blender or mini food processor or using an immersion blender. 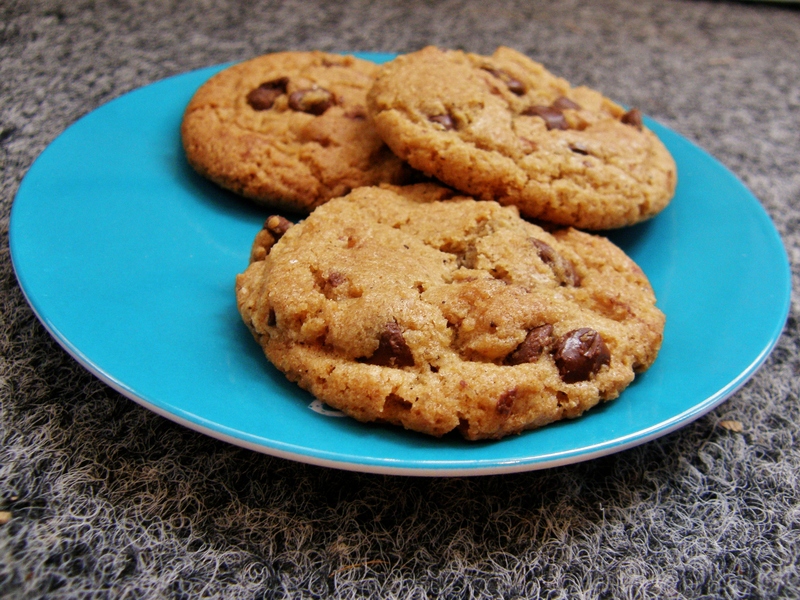 Bake until cookies turn slightly golden, about 12 to 15 minutes depending on desired crispness. Let cool on cookie sheet for 1 to 2 minutes and then remove to a wire rack to cool completely. 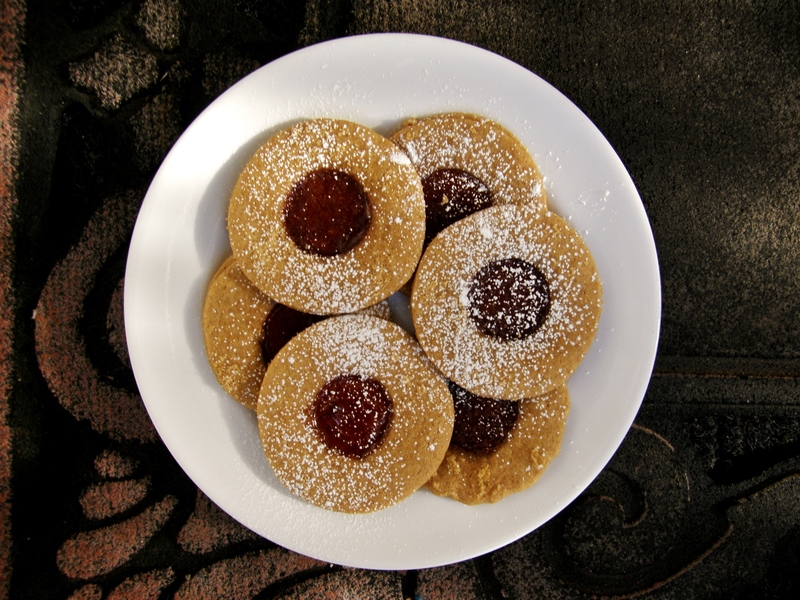 After cooling, spread a little schmear of pb on the underside of a cookie, and a little dollop of jelly of another. Squish together. Stack the sandwiches on top of each other for a whimsical presentation. They were a bit softer than I’d like upon eating them alone. I’d cook them the full cooking time instead. Also, I stupidly left out the salt, thinking that the salt from the canned chickpea liquid would be enough; however, the cookie wasn’t that flavorful itself. Coupled with using unsalted peanut butter, the cookie lacked flavor. With the addition of the 1/2 teaspoon of salt and longer cooking time these would be delectable. 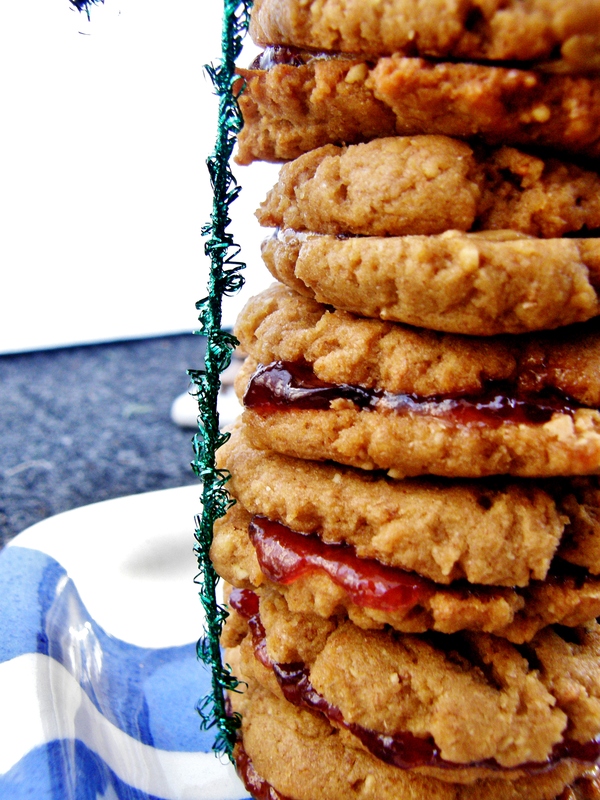 However, it all worked out, because these cookies became the perfect vessel for mini peanut butter & jelly sandwiches! Sometimes, you need to dig out the blender. Add all of the above into a blender and blend until smooth. 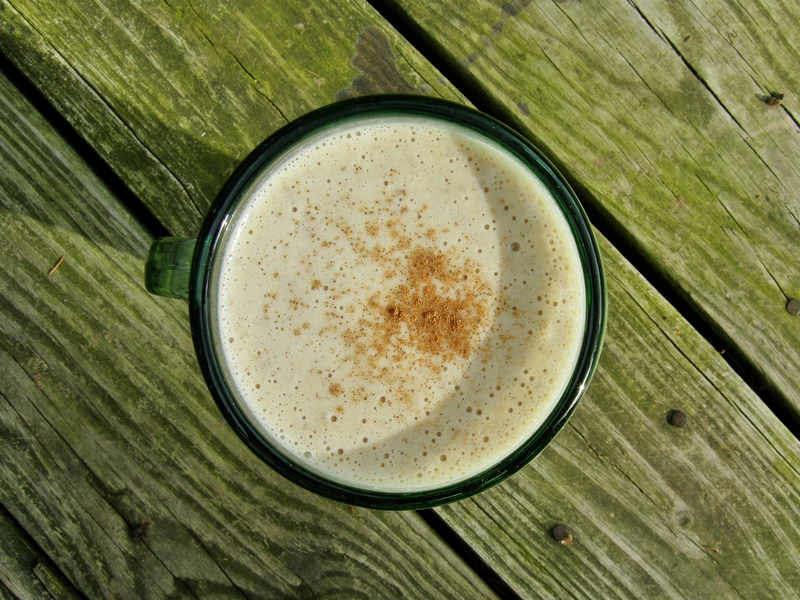 Cinnamon lovers, add some cinnamon. 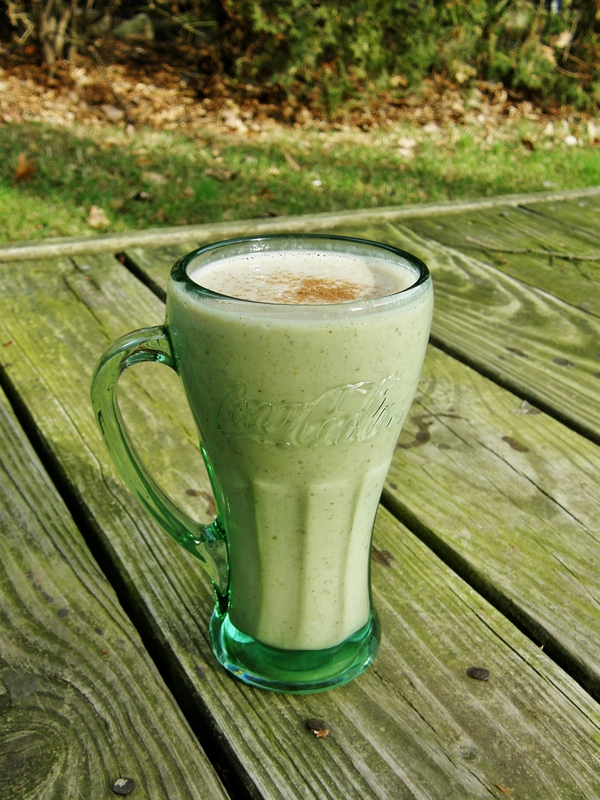 This milkshake was so delicious — enjoyed immediately or the next morning (it thickens up overnight in the fridge!) The recipe originally calls for pre-grinding the oats, but they grind up just fine in the blender as is. Also, originally, honey is added, but I skipped it because bananas are already so sweet. This is super filling and great for a post-workout meal/snack. It’s nutritionally dense with tons of protein, healthy fats, potassium for healing sore muscles and fiber for… a sound body. I don’t normally make smoothies or milkshakes but this one is a winner. 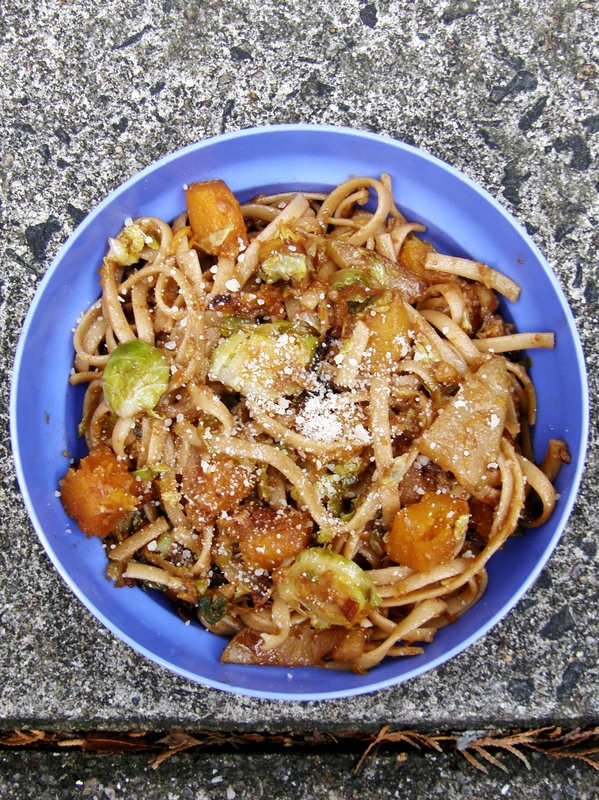 Butternut squash and Brussels sprouts don’t have to make a once-a-year appearance at Thanksgiving. 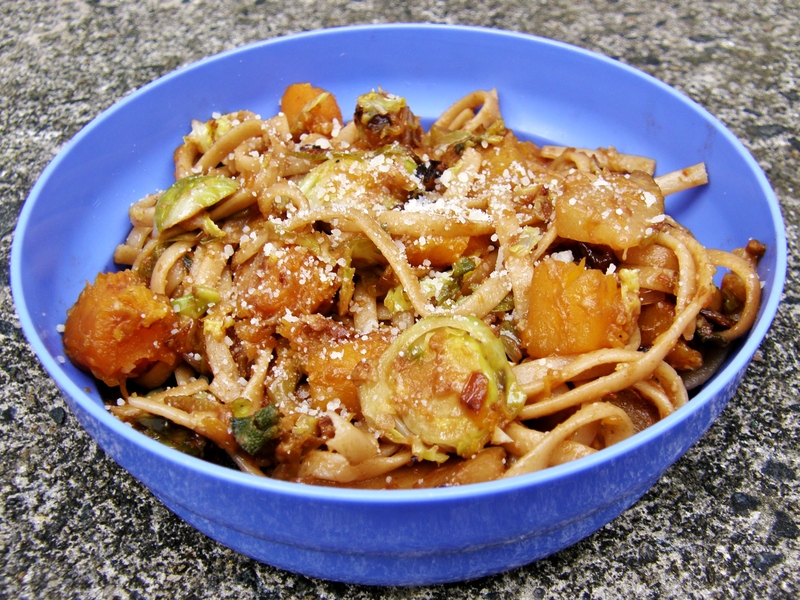 Pears, Brussels, squash, shallots, garlic. All caramelized to a tasty golden brown before adding some cool fig balsamic vinegar I got one day at a farmer’s market. Serve it in a bright blue bowl from your childhood days. You know, just for fun. Heat a large skillet over medium heat and add olive oil and butter. Add shallots, garlic, squash, brussels sprouts, sage and pear, top with salt and pepper, then stir to coat. Cook for 6-8 minutes, stirring occasionally, then cover and cook for another 5 minutes. While veggies are cooking, boil water and prepare pasta according to directions. Turn heat under veggies down to low, then add balsamic and stir. 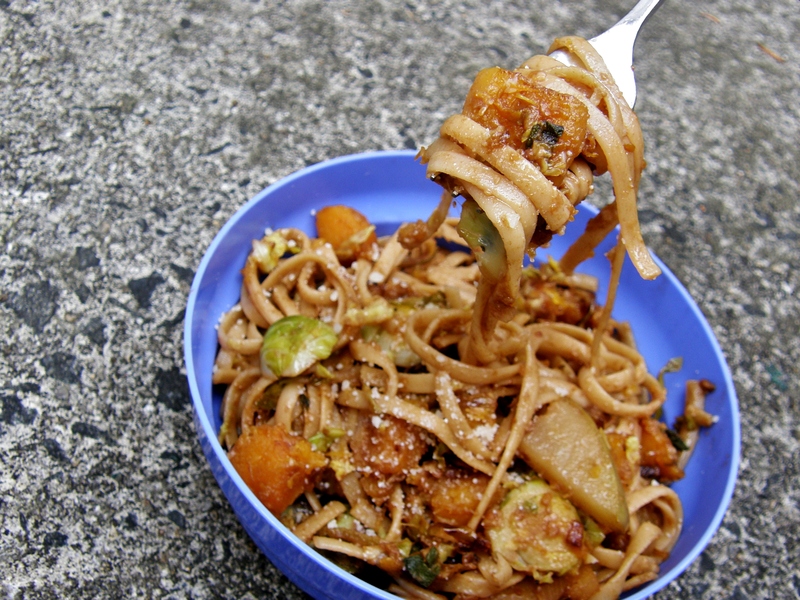 Drain pasta, return to pot, and add veggies to pasta, toss many times to coat evenly. Add in parmesan cheese, taste, and season more if desired. Serve with additional parmesan cheese for topping. This was so insanely good. So many different textures, tastes… subtle sweetness from the pears, contrasting a nicely crunchy and bitter flavor from the sprouts, with the tenderness of the butternut and tang of the cheese. Let’s just say this was gone in one night. I would totally double the recipe if I had a skillet large enough.